40 acres of unique, hard to find property. Lawn with flower beds, variety of trees, fruit trees & hedges, fenced garden area. Large garden area, Dog run with fully enclosed shed. Low Wyoming taxes, wildlife, spectacular views, excellent roads and easy access to Gillette, WY, Spearfish and Rapid City, SD. 3,200 sq ft house with loft. 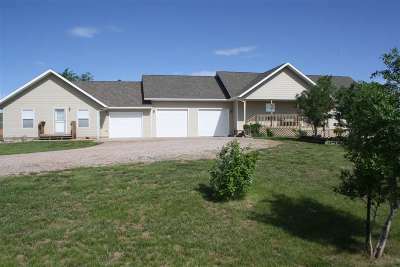 Full walkout basement with two finished bedrooms, full bath, large storage room. Main living area has bedroom, bathroom, mud room, kitchen/dining and living room, Vaulted ceiling, and propane fireplace. Covered front porch, back deck. Forced air heating and conditioning. Attached 800 sq ft mother-in-law house. Excellent rental possibilities, work from home opportunity, man cave. Three car attached garage. Water hydrant, excellent well. Fully enclosed 24x40 2-stall horse barn, hay storage, grooming area and tack room with electricity and water. Loafing area with two large corrals and 2 water hydrants. Another attached corral with shelter. 3 fenced pastures.